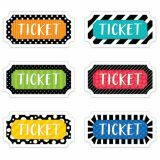 These Bold and Bright Tickets Student Incentives are a fun addition to your classroom management routine. They can be given out as incentive tokens for a wide variety of student behaviors including demonstrating a positive attitude, following directions, helping in the classroom, completing assignments on time, and doing well or trying hard on assignments. Students can collect, trade, or redeem the tickets for rewards or special privileges. The rainbow of colors, dots, and stripes creates a fun design that kids will love. Each ticket approx. 2½" x 1¼"